The bridge is slated for replacement, eventually. 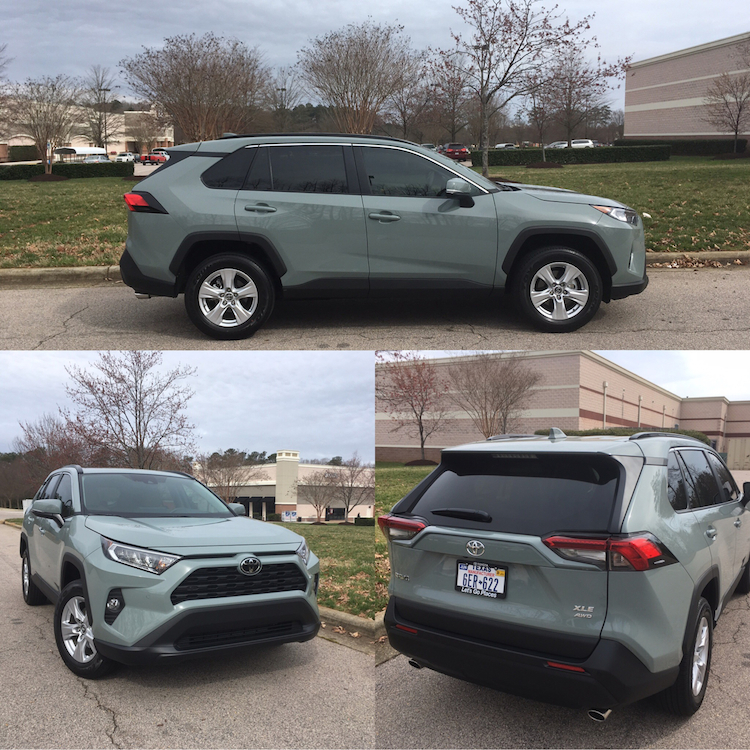 The 2019 Toyota RAV4 is a compact crossover utility vehicle with room for five. it comes with a four-cylinder engine, an 8-speed automatic transmission, and offers all-wheel drive. A hybrid variant is marketed separately. Launched stateside in 1996, the RAV4 has gradually grown in size and importance. Indeed, it is now Toyota’s best-selling model, even surpassing sales of the midsize Camry sedan and the compact Corolla — intrepid models both. For 2019, the RAV4 is all-new. It is based on Toyota’s latest global architecture and is slightly longer and wider than the preceding model. Toyota offers the 2019 RAV4 in five trims: LE ($25,500), XLE ($27,300), XLE Premium ($29,500), Adventure ($32,900), and Limited ($33,500). Add $1,060 for the delivery, processing & handling (destination) fee. All models come with ToyotaCare, a no-cost maintenance plan that covers most expenditures for two years or 25,000 miles as well all as roadside assistance for two years and unlimited miles. As for the hybrid version, it arrives later this model year. You’ll find LE, XLE, and Limited trims. We’ll cover over the various features offered. In the meantime, an assemblage of packages set these models apart beyond trim differences. For instance, the base LE model offers a blind spot monitor with rear cross-traffic alert for $590. Bundle it with the available tonneau cover and you’ll pay $680. Head to the XLE trim and you’ll find the XLE Convenience Package ($1,295) with it power liftgate, 8-way power-adjustable driver’s seat, and heated front seats. Increase your outlay to $2,335 and the package adds Entune 3.0 Plus, a six-speaker audio system with an 8-inch touchscreen, four charging ports, HD Radio, Siri Eyes Free, Apple CarPlay smartphone compatibility, Wi-Fi connect, and other amenities. It also includes a security system. The mid-range XLE Premium trim offers the Entune 3.0 audio system with 11 speakers ($1,620). For $2,885, the package adds such driver-assist features as intelligent clearance sonar and rear cross-traffic braking. A digital rearview mirror with HomeLink and a Qi-compatible wireless smartphone charging round out the offering here. The Adventure trim bundles the Entune system with navigation and an 11-speaker JBL audio system for $2,470. For $3,735, the package adds a power tilt-and-slide moonroof, and the driver-assist features found in the XLE Premium’s trim. At the Limited level, you’ll find a Limited Grade Advanced Technology Package ($1,605). This package combines Entune audio, navigation, a bird’s eye view camera, Qi-compatible wireless smartphone technology, and a power liftgate with the JBL 11-speaker audio system. For an additional $200, Toyota adds a panoramic glass roof with a power tilt-and-slide moonroof. And now for an essential disclaimer. My wife and I have owned or leased a Toyota RAV4 for many years, beginning with the 2004 model, followed by the 2013 and 2017 versions. Needless to say, when our current lease ends in 2020, the RAV4 will be among the few models considered. My wife also likes the Nissan Rogue. As for me, I’d be happy to upgrade to the Toyota RAV4. The forthcoming Ford Bronco also has my attention. As a RAV4 acolyte, it is easy to spot the changes from year to year as well as from generation to generation. Happily, the improvements with the fifth-generation RAV4 are more evolutionary than revolutionary, but they are quite evident nonetheless. Among the standout exterior features include the front fascia with its gaping grille and fog lamp cutouts, squared wheel wells, and rear roof pillar — the last window cants forward, instead of backward. Lighting changes, updated wheels, and fresh signature lines are also present. Inside, the cabin is slightly roomier than before. It offers sufficient room for five, although four is the ideal. We’ve witnessed the growing sophistication of this model down through the years and that’s something consumers should find pleasing. 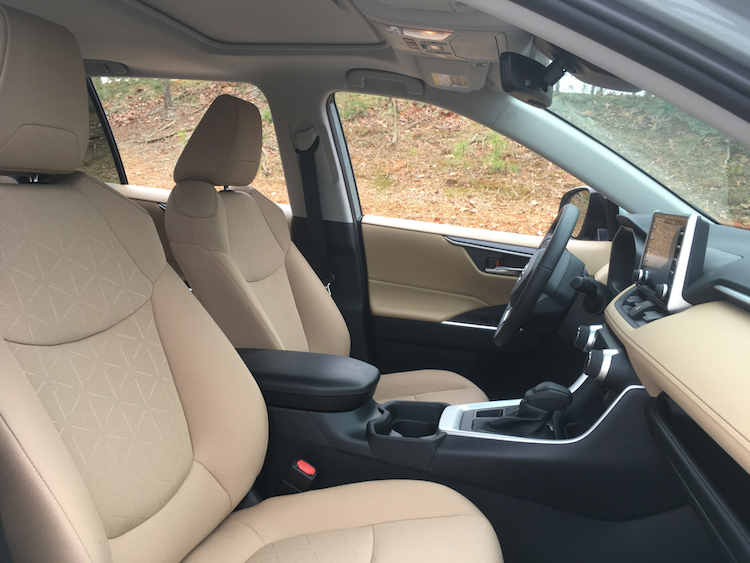 Our test XLE Premium model featured ample soft-touch materials across the lower dashboard and door inlays. Splitting the upper and lower dash sections is chrome-like trim. The upper portion is sculpted plastic, but with ample creases and lines to add distinction. 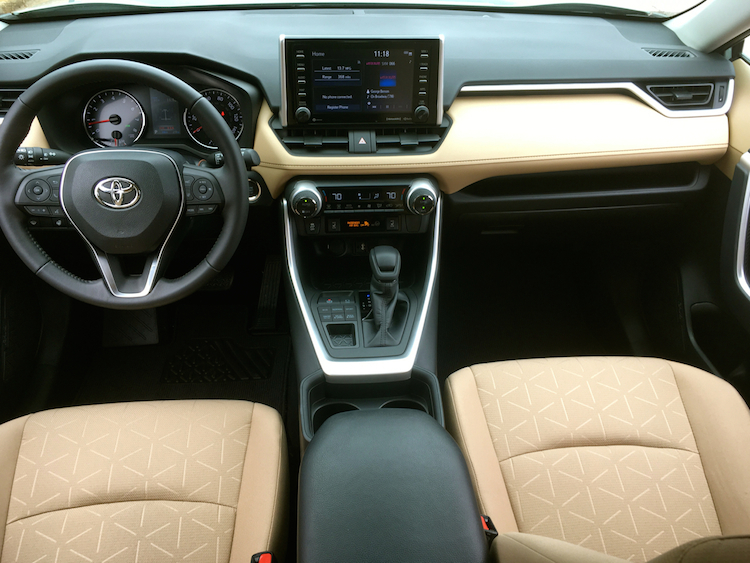 One of the biggest changes involves the touchscreen display as it is bolted to the top of the center stack where the two dashboard sections meet. We like the look of the screen as well as its location. Beneath the screen is the usual knob settings for managing the climate control system. At the base of the stack is a large open area for housing smartphones and making a connection. 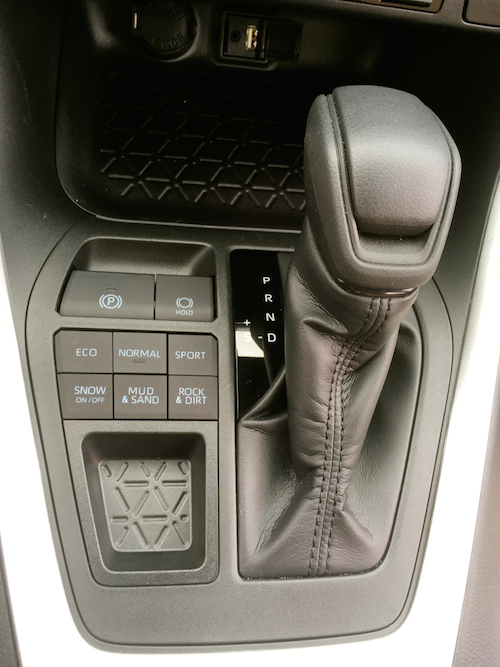 Switches for the automatic parking brake and hill hold are to the left of the transmission stick. Our all-wheel-drive model added three switches to the eco, normal and sport modes offered in the front-wheel-drive models. Here, you’ll find snow, mud & sand, and rock & dirt settings. 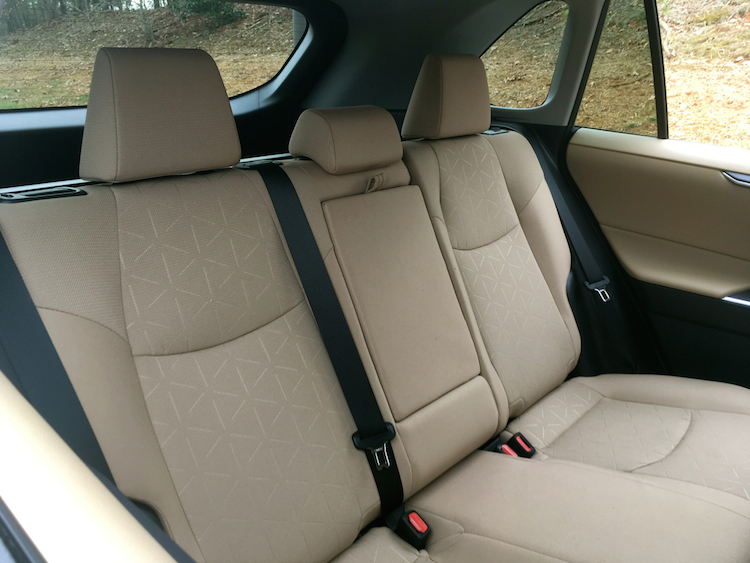 As for the seats, they’re trimmed in fabric on most models or dressed in SofTex, which is a brand of synthetic leather. Our test model had this material and we found it very comfortable and pleasing to the eye. An 8-way power driver’s seat is standard. 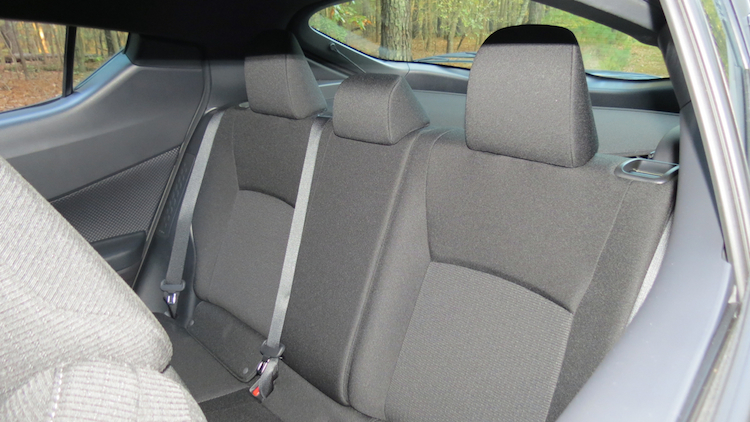 The rear seat is a 60-40 split fold-down arrangement with a center armrest and two cup holders. The list of standard features include power accessories, a tilt-and-telescopic steering column, and air conditioning. Trim-level and package upgrades bring in a leather-wrapped steering wheel, dual-zone climate control, heated and ventilated front seats, and rear outboard heated seats. With a new model to show for it, the Toyota RAV4 will undergo the usual safety tests as conducted by the Insurance Institute for Highway Safety and the National Highway Traffic Safety Administration. Auto Trends prefers the IIHS’ tests as they’re more rigorous and detailed. In any case, we expect the new model to achieve at least a Top Safety Pick rating from the IIHS and perhaps win its highly coveted “+” rating if this model’s advanced driver-assist features and available headlight upgrades pass muster. In any case, the RAV4 comes with the Toyota Safety Sense 2.0 (TSS 2.0), which includes a pre-collision system with pedestrian detection, lane departure alert with steering assist, lane departure alert, automatic high beams, radar cruise control, road sign assist and lane tracing assist. Notably, this system builds on the company’s standard Star Safety System with automatic smart stop technology. Optional to the XLE and standard on the upper trims is a blind spot monitor with rear cross-traffic alert, intelligent clearance sonar with rear cross-traffic braking. All models have at least some type of security system. 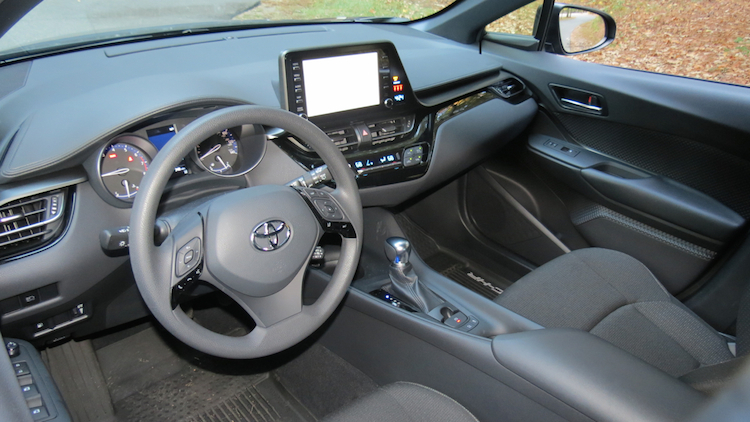 As for audio packages, the standard system includes a 7-inch touchscreen, six speakers, Bluetooth, Siri Eyes Free, Apple CarPlay smartphone compatibility, and four USB ports. Among the upgrades are an 8-inch touchscreen, HD Radio, up to 11 speakers, and navigation. Under the hood resides a familiar 2.5-liter four-cylinder engine. 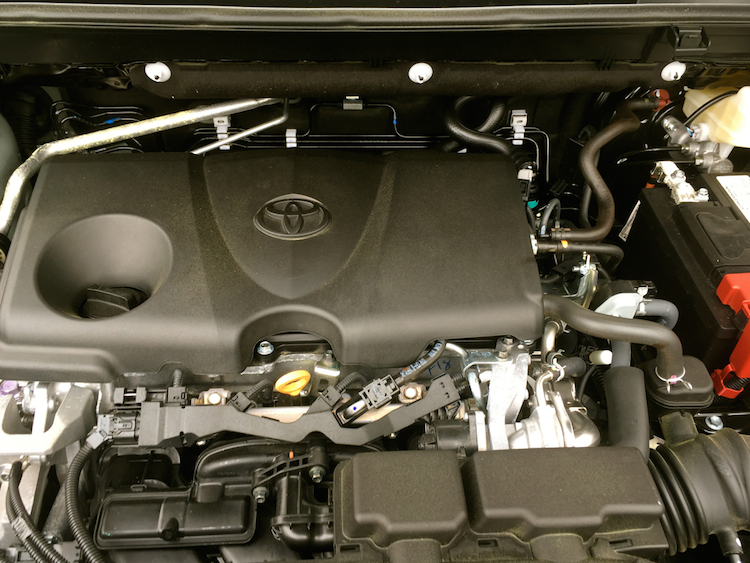 For the current-generation model, Toyota tweaked this engine to make it more powerful and thermally efficient. Thus, it now delivers 203 horsepower and 184 pound-feet of torque. That’s up significantly from the 176 horsepower and 172 pound-feet of torque furnished previously. Another change Toyota made was upgrading from a six-speed automatic transmission to an eight-speed. 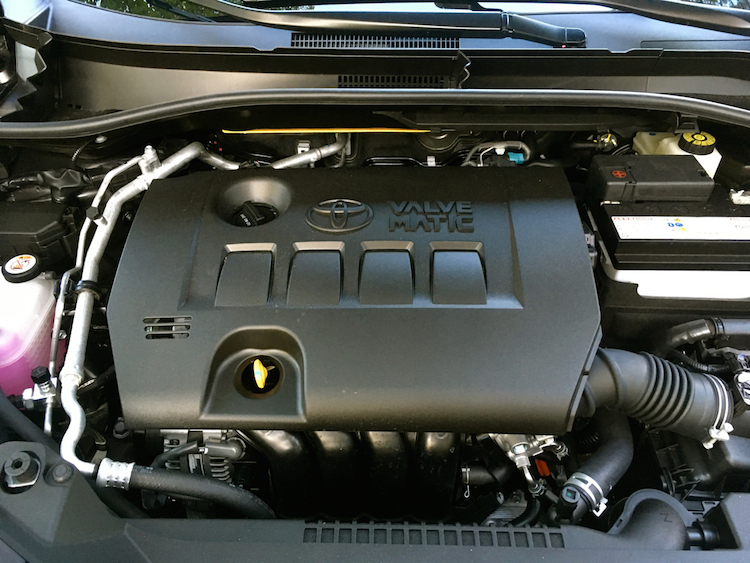 What’s interesting about this combination is that it delivers more power and better efficiency to the RAV4. The previous front-wheel-drive model earned 23 mpg in the city and 29 mpg on the highway for a combined 25 mpg. This year, that same model earns 26/35/30 mpg. That’s a 5 mpg improvement. As for performance, the RAV4 delivers adequate step-off power and decent passing power. Under a full load, the engine has its work cut out for it, but it doesn’t lag. The new transmission shifts smoothly between gears. No hunting was felt or observed. This SUV’s steering provides a level of connectivity we like and it handles well. With available all-wheel drive, you’ll find the system does an admirable job of shifting power from front to back as well as from side to side. Beginning at the Adventure trim, the system employs torque vectoring, which transfers power to the wheels with the most traction. This system will cost you about 2 mpg, however. 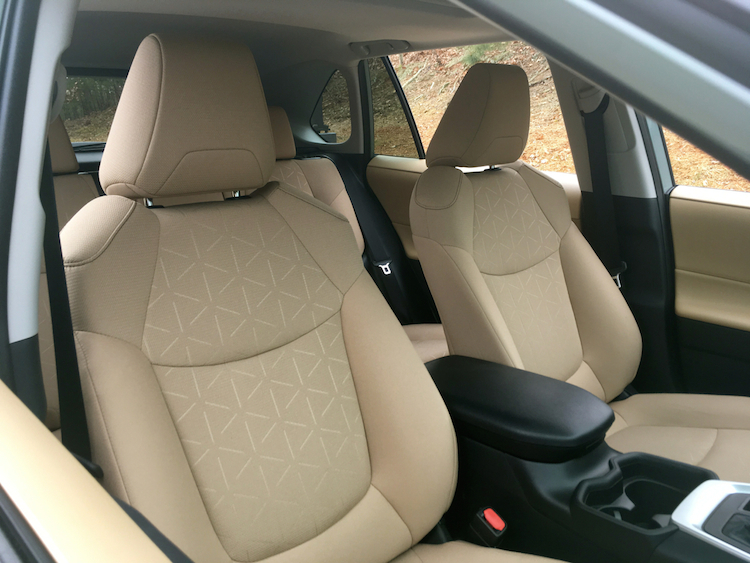 Concerning ride comfort, the RAV4 matches the segment leaders. The cabin, though, isn’t the quietest in the segment. In fact, under hard acceleration, you’ll hear the engine. That’s fine for a V8, but not so much for a conventional four-pot. There is one other important point of note: most models have a 1,500-pound towing capacity. That’s sufficient for a small camper. Choose the Adventure trim and towing capacity increases to 2,900 pounds (front-wheel drive) or to 3,500 pounds (all-wheel drive). This enhanced towing capability is something to consider when comparing small SUVs. 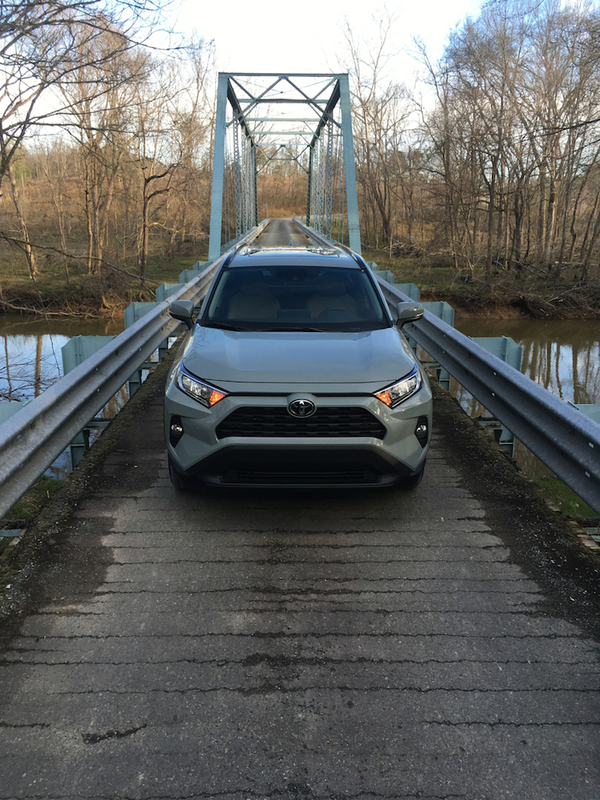 The Toyota RAV4 has a lot going for it. The new design, upgraded powertrain, and advanced safety technologies keep it competitive in a dynamic segment. Moreover, we’re glad that Apple CarPlay smartphone compatibility is finally here. Unfortunately, Google Android Auto fans will have to wait at least another year for integration. We rarely recommend the base model for any vehicle. And this holds true for the RAV4. You might start your search with the XLE trim, but we think you’d be in a better position to consider the XLE Premium as it offers superior bang for the buck. We always recommend all-wheel drive for anyone living in the northern states or wherever wintry conditions take hold. As for the hybrid, its late arrival may yet supply a justifiable alternative, especially if the price discrepancy between the standard and hybrid models is under $2,000. 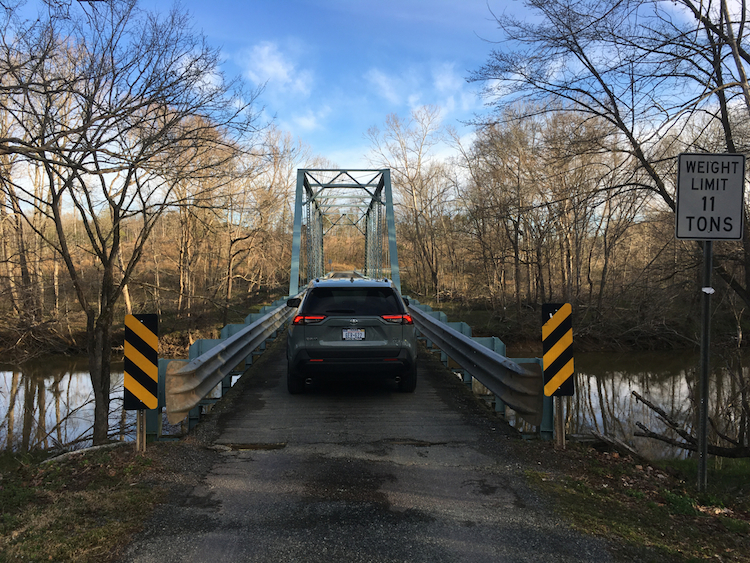 All in all, the 2019 Toyota RAV4 does what it needs to do and better. 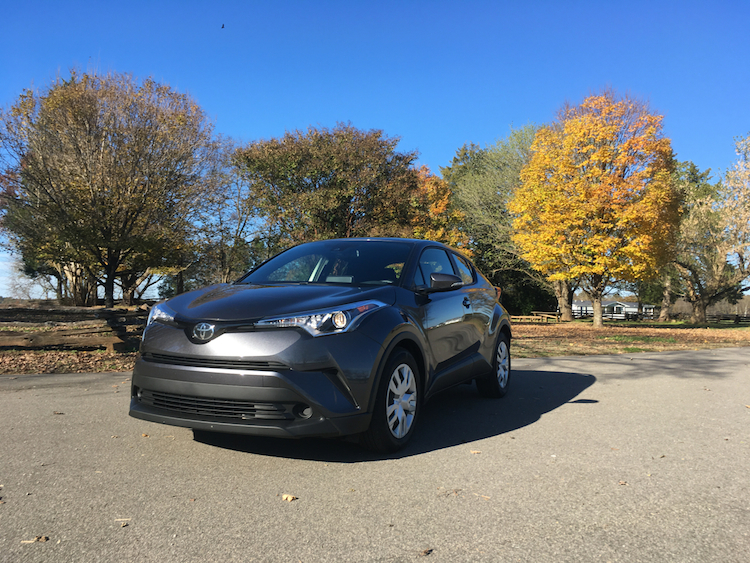 It supplies a viable alternative to the Corolla and Camry, and fits nicely between the smaller C-HR and the midsize Highlander utility vehicles. 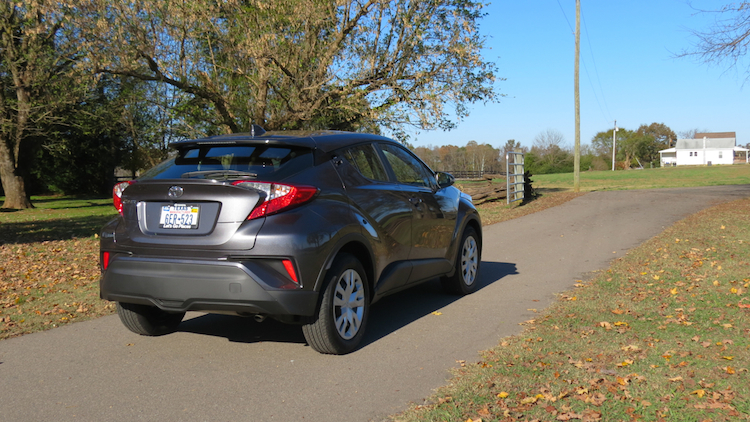 The C-HR brings it to the small crossover segment, but in a different way. Toyota’s small C-HR is big on dramatic touches. We like crossovers and are buying them in record numbers. That said, Toyota recognizes that there is some ambivalence amongst buyers, which is why we have a model such as the Toyota C-HR, a compact crossover that seems more car-like than its competitors. 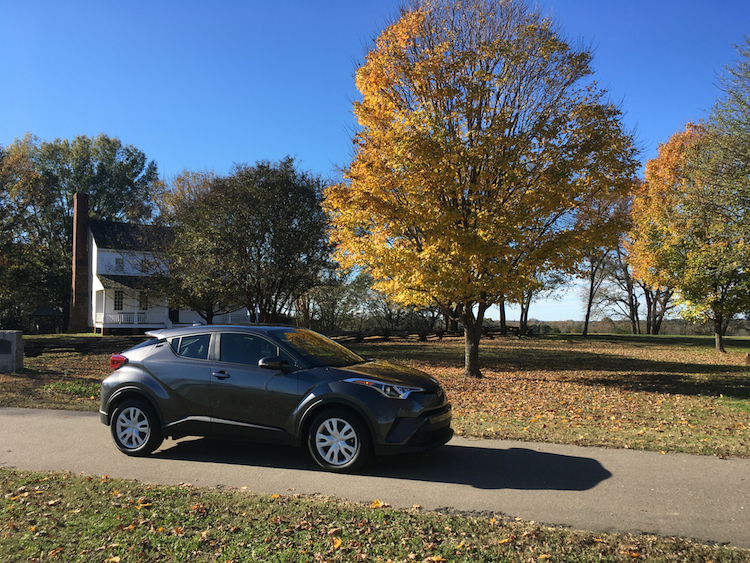 Auto Trends has been keeping track of the C-HR ever since this writer was invited to Texas in February 2017 to preview and drive one. Our follow-up test drives have given us a clearer picture of what this model is all about. This article serves as a summation of all things C-HR. 1. This is not your average subcompact SUV. The Toyota C-HR slots beneath the compact RAV4 crossover utility vehicle. 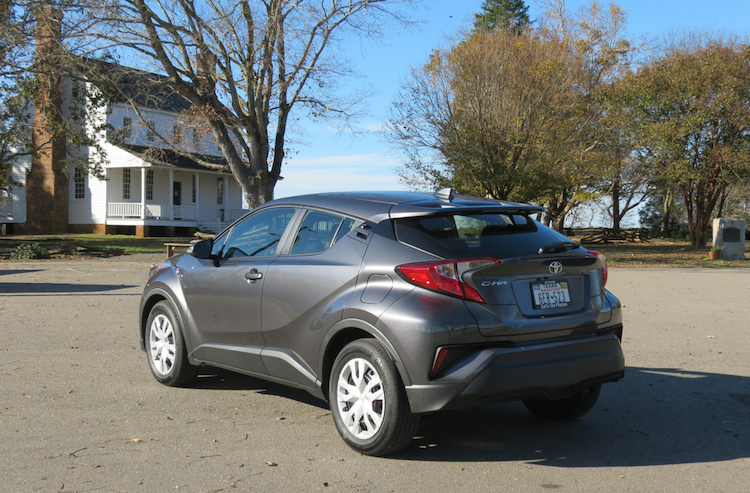 With this point in mind, you’d think that the C-HR is a subcompact model. Well, not quite. Instead, it is slightly larger than the average subcompact and is, therefore, considered a compact model by Toyota. That said, the C-HR is similar in size to the Nissan Rogue Sport, another plus-sized subcompact model. This Toyota’s interior is fairly roomy, but the sloping roofline may impede head space for certain tall passengers. 2. A price point we can live with. Happily, Toyota is sticking with cars even as its American competitors cut their offerings to the bone. This means shoppers will still find several sub-$20,000 new cars, a sensitive price point for first-time car shoppers. The C-HR is price conscious and sensible too. It costs $20,945 for the LE trim and increases to $22,980 for the XLE. This vehicle tops out at $26,000 for the Limited. Add $995 for the destination charge. So, although its price starts a bit higher than the similar-sized Corolla, the C-HR doesn’t max out at $30,000 as do some of its competitors. 3. Styling that is anything but bland. Toyota has heard every one of our comments about its bland cars and has responded by overhauling the look of its product line. No longer can we say that the Camry is dull. Even the Corolla in hatchback form looks sporty and it will soon be joined by a new sedan. We won’t leave out the Avalon, which also loses its yawning looks. As for the C-HR, it makes a great effort to follow a fresh route and so much so that its beefy front fascia, fat wheel flares, high profile, and jumbo-sized tail lamps may put off some. Never mind the hidden rear door handles, which give this model its coupe-like looks. Inside, the dramatic flair continues with its stacked surfaces, flowing lines, and diamond-shaped trim. This is what happens when you give your designers a license to create — it results in a welcome departure from everything preceding it. 4. You can’t have all-wheel drive or a manual transmission. Unlike nearly all small SUVs, this Toyota comes with front-wheel drive only. You won’t find all-wheel drive, which is an option in every other model except the Nissan Kicks. What’s odd is that the C-HR offers all-wheel drive in some other markets, but not in North America. Toyota wants customers to perceive the C-HR as a raised hatchback more than simply a utility vehicle. But they also missed an opportunity to offer a manual gearbox, which might entice Corolla and 86 shoppers. Future upgrades are likely to make all-wheel drive available, but don’t look for the manual to arrive on our shores. 5. An innovative powertrain with a “smart” CVT. Toyota equips the C-HR with a 2.0-liter four-cylinder engine, which generates 144 horsepower and 139 pound-feet of torque. This engine works with a continuously variable transmission. Now before you get your knickers tightened in a wad, you should know that Toyota’s CVT is unusual as it includes a fixed gear. What’s the advantage of such a gear? In all things acceleration, that’s what. CVTs are more efficient than automatic transmissions, but they’re also slow to get going. With a fixed gear included, you can launch with confidence and then enjoy the efficiencies of a CVT. Another point I personally like about this CVT is that Toyota manages the stretching feeling you typically detect when accelerating hard. Just before the engine reaches maximum RPM, power automatically cuts, not too unlike the way an automatic shifts gears. The sensitive and knowledgeable among you will still know that it is a CVT, but I’m thinking you’ll appreciate the way Toyota addresses its darker side. 6. Safety is not an afterthought. Customers demand advanced safety features and Toyota delivers. Every C-HR model comes with the Toyota Safety Sense P (TSS-P) suite, a comprehensive driver assist safety package. It represents a pre-collision system with pedestrian detection, lane departure alert with steering assist, automatic high beams, and full-range radar cruise control. These features typically cost thousands of dollars extra. Moreover, they are not offered in some competing models, including the Ford EcoSport. 7. Straightforward trim levels with one significant package offering. Toyota keeps things simple with the C-HR, offering three distinctly equipped trims with few package offerings. The differences between trims include steel wheels with the base models and alloy wheels elsewhere, fog lights on the top-trim and puddle lamps on all but the base model. You’ll also find special paint schemes above the base model, including attractive two-tone colors with white roofs. 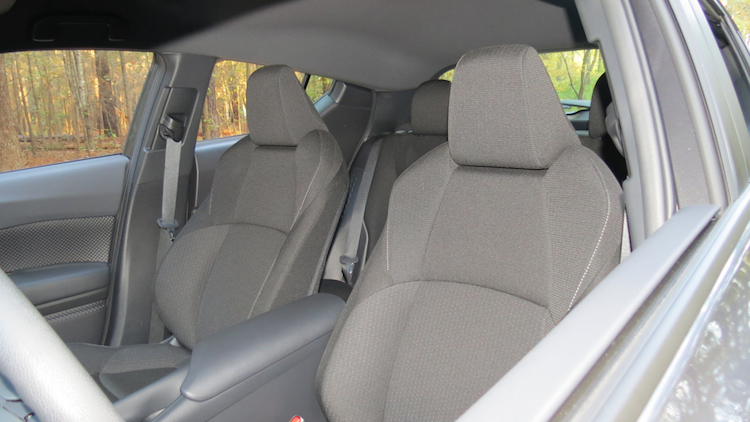 Cloth seats are standard, while the Limited is dressed in leather. Keyless entry, full power accessories, and an 8-inch touchscreen display are among the standard items inside. 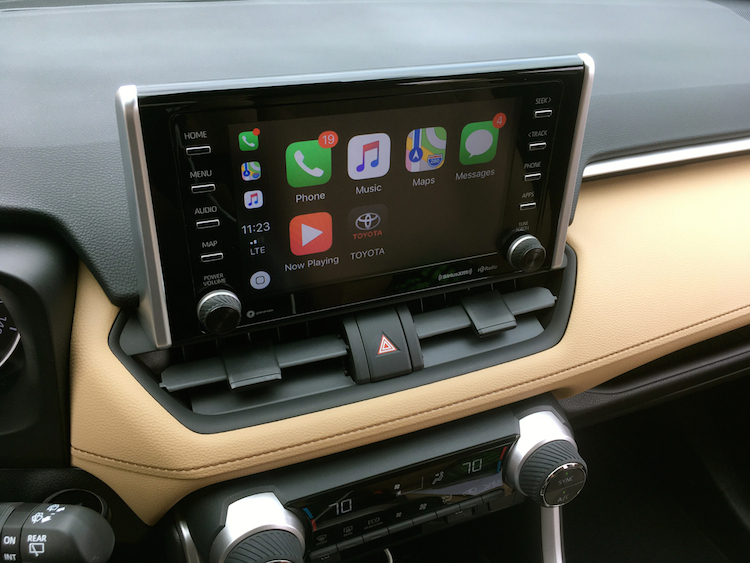 The Limited trim offers a Premium Entune Audio Package ($1,725), which adds such features as navigation, Apple CarPlay, Siri Eyes Free, and Wi-Fi connected services. Sadly, you won’t find Android Auto smartphone compatibility. Toyota is still working out a few issues it has with Google. We expect Android compatibility to arrive sometime next year, however. If the Toyota C-HR is on your shopping list, you are now armed with information that should assist you as you compare trims. My advice to shoppers is to take this model out on an open road and test how it behaves. Keep this point in mind: by no means is this a fast vehicle. In fact, if you’re looking for speed, you’ll need to look elsewhere. The C-HR’s steering is targeted and handling is decent, as this small ute holds the road better than the average crossover. This is also where a manual gearbox would be fun, supplying the Toyota with a feature we enjoyed in the now-retired Nissan Juke. Alas, manual demand is simply too small for manufacturers to consider offering one. 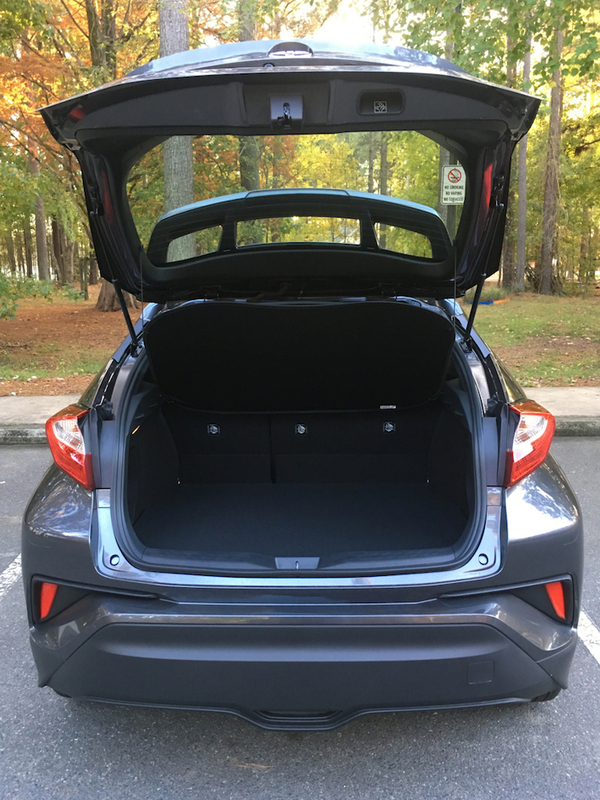 Lastly, if you’re buying the C-HR with your family in mind, you’ll want to familiarize yourself with the back seat and the storage area. The back department is suitable for children, but your teens may object. Further, its storage capacity is on the small size. On the other hand, a Toyota RAV4 is a more suitable model for families with teens and for people who need ample storage space.